I was pleasantly surprised by this unique twist on the vampire novel. I can hardly bear to pick up a book with vampires anymore after Twilight left such a bad taste in my mouth, but Robin McKinley’s story of a girl who finds herself tangled up with vampires has a self-possessed and interesting narrator. To me, the most compelling part of the story is Sunshine’s discovery of her own magical ability and her struggle to grow into her talent and the responsibility that goes with it. Sunshine’s psychological responses to her confrontation with evil are refreshingly accurate; McKinley never fails to impress me with her ability to write accurate portrayals of characters processing trauma (this is one of the many reasons why I love Deerskin). However what I did NOT find successful was the novel’s rambling, fragmented, stream of consciousness narration. The book could have been half as long if Sunshine didn’t continually repeat herself and embark on long, seemingly irrelevant tangents. Much of the slang that was created to lend authenticity to the world felt forced (such as “globenet” for internet and “fo” for information); the world could have stood very convincingly on its own simply with the explanation of its history and otherworldly species. Despite its dragging pace the ending felt abrupt- the story stops at the beginning of a new chapter of Sunshine’s life and what happens after seems full of narrative potential. 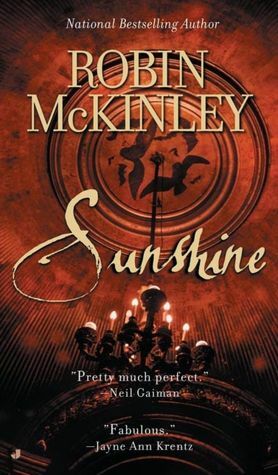 I would have enjoyed the book much more if McKinley had cut back on some of Sunshine’s rambling and gone further into the adventures of her new life.